AOMEI Backupper is a free software that can easily do hard disk imaging for Windows 7 with a couple of clicks. Disk image backup restoring is very easy as well. What is a disk image? A disk image is a copy of the entire contents of a storage device, like a hard disk, SSD, etc. The disk image represents the content exactly as it is on the original storage device, including both data and structure information. Many Windows 7 users might have already met a problem - system crash. It will probably cause serious data loss so that you must reinstall operating system and applications again, which is a time-consuming project. In order to avoid such case, disk imaging is an ideal solution. 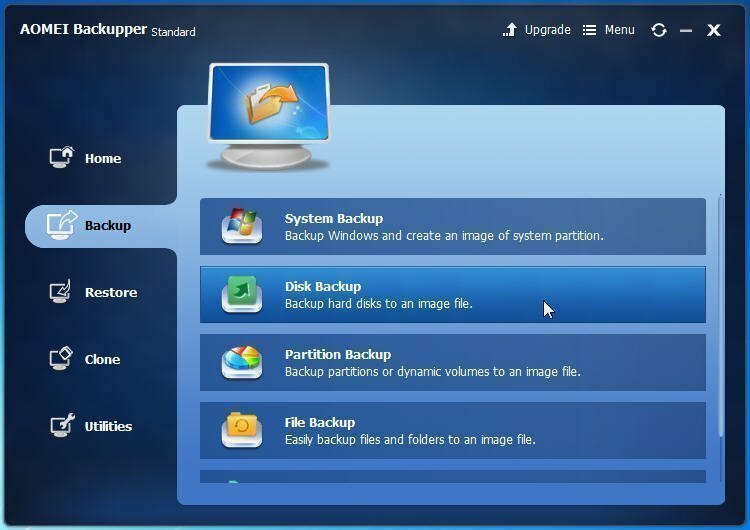 A disk image backup will be created for the preparation when you need to recover Windows 7 system or restore any necessary files. However, since there are many software on the market, which one to choose? 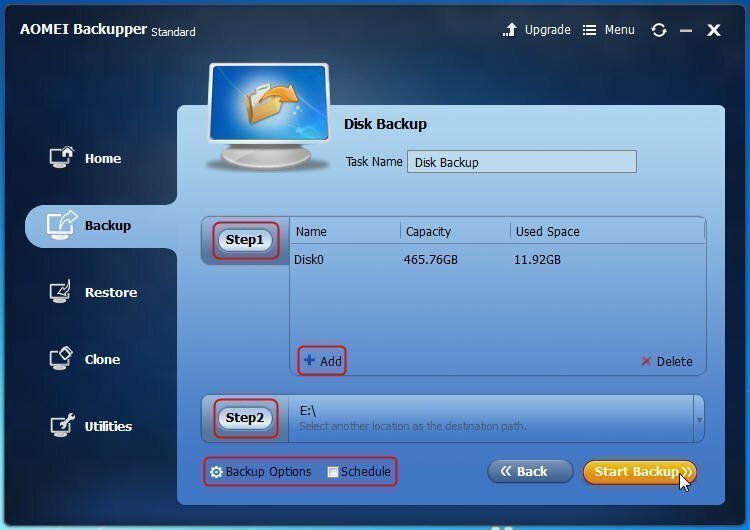 AOMEI Backupper is quickly becoming one of the most popular backup software on the market. It’s loaded with features that make backing up a breeze. Disk backups can be created with just a couple of clicks. Restoring is easy as well. In addition, this program is completely free! So following steps will show you how to do disk imaging for Windows 7 with free AOMEI Backupper. By the way, Windows 8/8.1/10/XP and Vista are all supported. Above all, please download AOMEI Backupper Standard Version. Install and launch it. Step 1: Select “Disk Backup” under Backup bar. Step 2: Name the disk imaging for better distinction. Then select source disk and destination path in “Step1” and “Step2”. Tips: You are allowed to backup multiple disks at the same time by clicking “Add”. “Backup Options” and “Schedule” are capable to be set based on your demands. But pay attention that if you choose “Make an Exact Copy” in backup options, it will copy all sectors on the disk so that the image file can not be saved on the source partition. In such case, you can save the disk image backup on another internal disk, external hard drive, NAS device or network drive, etc. 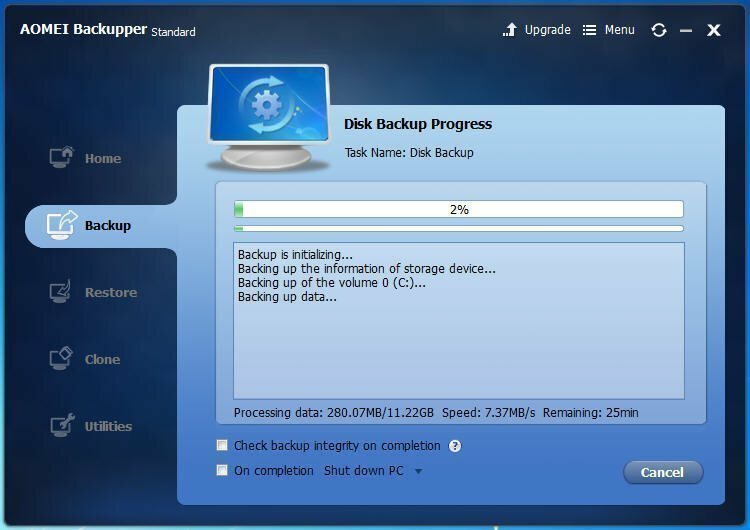 Step 3: Click “Start Backup” to carry out and you need wait for a while until the operation is finished. In conclusion, no matter how many data on any type of storage device are lost, they are able to be recovered from the backed up image file easily. Hence, one can see that how important the backup is! Besides, although AOMEI Backupper is a free Windows 7 disk imaging software, its functions are not inferior to others’. There’s also AOMEI Backupper Pro version for advanced users.